NOTE: This is NOT the usual Nasawing you find on other sites: this one is altered to give it better performance. The nose section as well as the bridling have been altered: it has more speed and pull and a bigger window compared to the original wing. 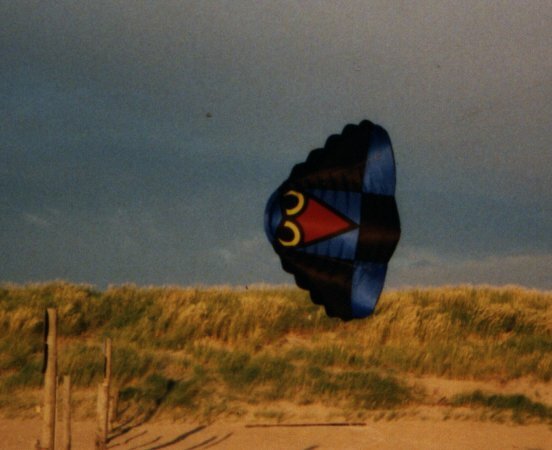 This is truly an amazing kite: a single skin soft kite that is easy to make and that can be flown as two or quad line...if there is any wind it will fly! Folded up the line and handles will take more space than the 3 m2 kite: It's the true backpackers dream. It can be built as a 1 m^2 funkite or even a 5 m^2 beast. I made a complete step by step description of a 2.3 square meters Nasawing: these mesurements were chosen to make it as economical as possible out of 1 meter wide ripstop. I've made a small Win95 prog to calculate the Enhanced Nasawing in any size. It includes the description on these pages and it's about 380K in size. This is the latest new version, that corrects a small error in calculating the tie length. I've solved the problems with the calc. that people had when they use "," as decimal separator, also added the total bridle line lenght.